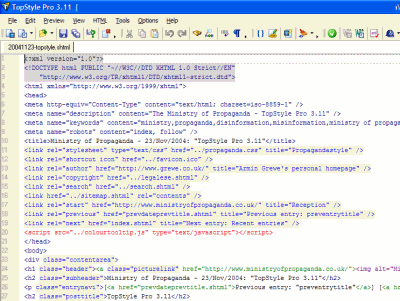 Ministry of Propaganda - 23/Nov/2004: "TopStyle Pro 3.11"
This entry is probably of little interest for most of my readers, but some might find it interesting: I'm using TopStyle Pro for all my websites (writing them, HTML and CSS etc), including writing this blog. With Nick Bradbury spending a lot of time on developing FeedDemon and the latest release of TopStyle from early 2003 I (and I think a few others) was getting a bit worried about future development of this excellent HTML/CSS editor. To my (and quite few other people's) relief a few months ago Nick clarified that development of TopStyle Pro would continue and soon the first beta versions started to appear. And a few days ago TopStyle Pro 3.11 was released. No problems at all so far and I've already started to appreciate some of the new features. Thanks for this update and I'm looking forward to future developments, Nick!